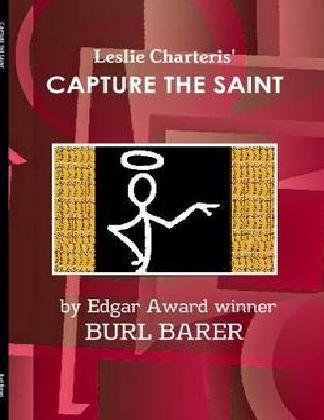 Capture The Saint by Burl Barer is quickly climbing the UK Kindle charts. Burl reports on Twitter that it is currently #26 on the Amazon UK charts for British Detective mystery books on the Kindle! Move him up! Why are you still alive, Mr. Templar"
Simon Templar, alias the Saint, was only momentarily taken aback by the one unreherarsed question posed by perky television talk-show host Connie Cain during the live afternoon broadcast of Seattle, Washington's most popular local program. "Mythological characters such as myself seldom age at the going rate," responded the Saint cheerfully. "And if survival is the topic," offered Simon, "I have been shot at, shackled, handcuffed, gassed, and interviewed by trained broadcast journalists -- the relative degree of danger inherent in each being open to debate." The small studio audience laughed warmly and applauded with approval as the mildly bemused and professionally coiffed hostess signaled for a commercial break. "You are very good at this, Mr. Templar. Do you do a lot of television?" Her question seemed curiously genuine in contrast to the alternately sanguin and sacharine couching of her on-air delivery. "I find precious little on television worth watching," stated Simon with disarming honesty. "But this is more fun than being either shackled or gassed, although I was once grilled for information under lights almost as intense as these." 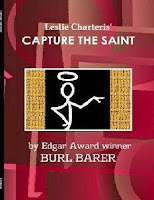 You can read more on your Kindle by buying Burl Barer's Capture The Saint, UK Kindle edition from Amazon UK, or if you're in the United States, you can have Capture The Saint for $2.99 for the US version of the Amazon Kindle. You can also read Kindle books on your PC for free, by installing the free Amazon Kindle for your PC software. Very good for Burl. Perhaps this will help us creep towards a new TV show. By the way went to see the off broadway edition of Hitchcocks 39 steps in NYC. Even though a comedy this period piece did remind me of the older Saint movies. Burl's success on Kindle points to a still potential market for Templar. People still want that type of non governmental hero. More news on that to come shortly, and we're all looking forward to the book that Burl is currently writing!